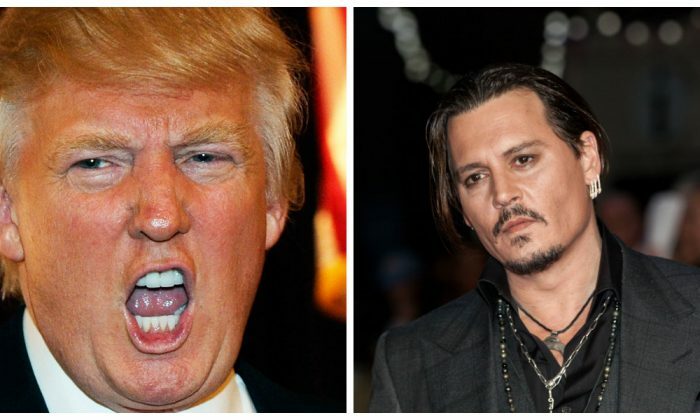 Actor Johnny Depp is the latest to speak out against presidential hopeful Donald Trump. He called Trump a “brat” at a talk at Arizona State University. The remarks were said during a conversation with Arizona State’s Origins Project founder Lawrence Krauss, about “humanity in madness” on March 12. The comments come after Depp’s recent portrayal of Trump in the 50-minute comedy, “Funny or Die Presents Donald Trump’s The Art of the Deal: The Movie,” which is named after Trump’s 1987 business advice book. “It’s not just about being a rich kid—I approached Donald Trump as what you kind of see in him when you really watch him,” said the actor. “There’s something creative about him in a sense of bullydom. But what he is, I believe, is a brat,” he added. The audience then broke out in laughter and cheers. Depp joins the list of other hollywood stars that have spoken against Trump. John Legend also recently took to Twitter to express his outrage at the treatment of protesters at Trump’s rallies.
.@DonaldJTrumpJr I think they were protesting your racist father. This isn’t complicated. Louis C.K. also expressed his feelings against Trump recently. The comedian called him an “insane bigot” and compared him to Hitler.